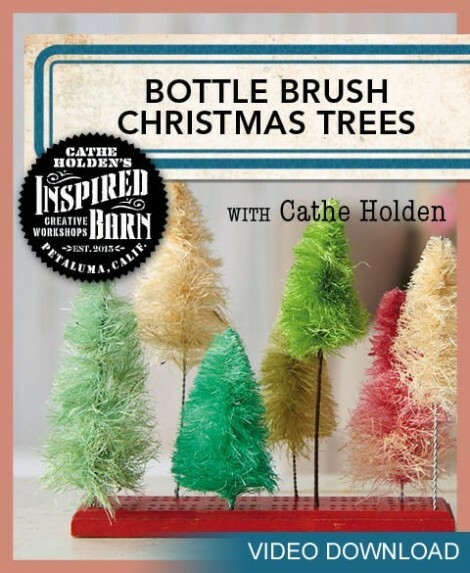 I am in Santa Cruz this weekend for the Goat Hill Fair where I am demonstrating a fun and timely craft project- Vintage-Style Bottle Brush Trees! I’m not just showing how to use them in projects, but how to actually make your own and customize them to suit your crafts! I brought along lots of examples to share at the fair and thought you’d like a little inspiration, too. Here is a photo of two bottle brush trees. The one on the left was made in China. The one on the right was made in Petaluma, by me. 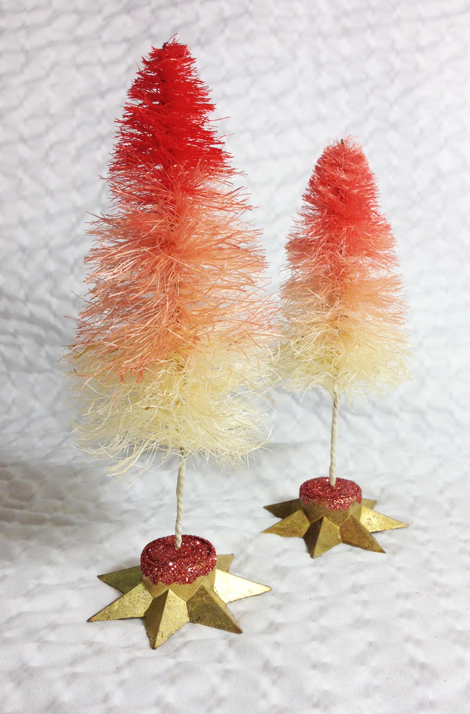 2015 UPDATE: You can now purchase my Bottle Brush Christmas Tree video download to watch exactly how to craft these trees yourself! 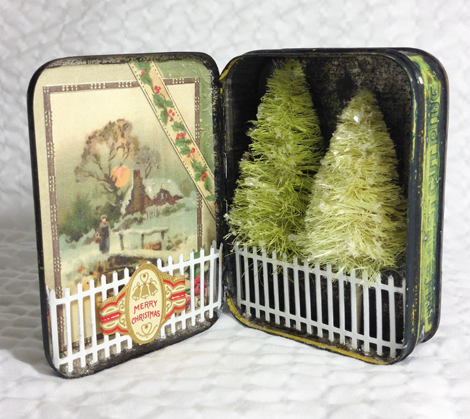 These trees were tucked into a grungy vintage tobacco tin opposite a reproduced postcard image. Both sides were finished with craft store fencing. 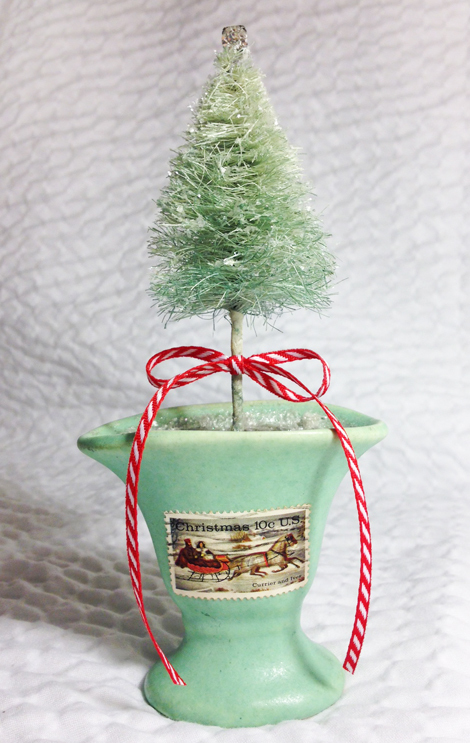 A little pottery vase makes a cute tree urn decorated with a vintage postage stamp. This tree was lightly painted with Mod Podge then dusted with mica flakes. 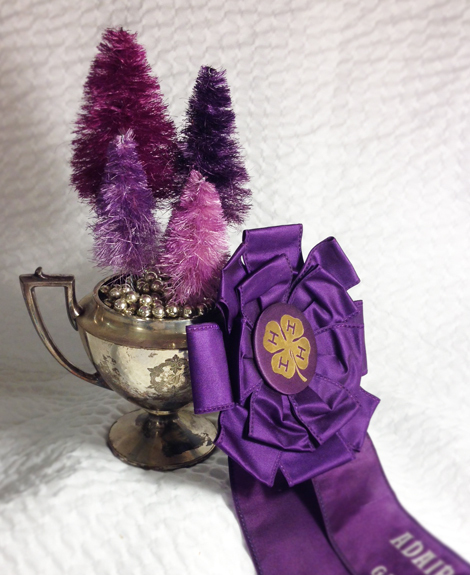 Here’s a purple display made from a vintage silver sugar container (with a glittered styrofoam ball inserted to hold the trees) and covered in murcury glass garland, and finished with a county fair rosette. This little sweetie fit just right into a vintage spool of thread (secured with hot glue) and topped with a stamped brass embellishment. I just love this old Ball freezer jar, perfect for a frozen display. 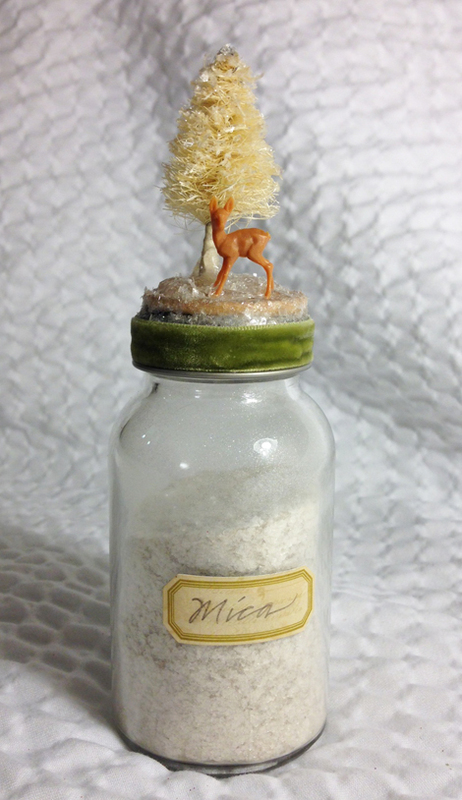 My St. Nicholas is a little vintage ornament with string removed. By dipping in two of the same color- one diluted more than the other- I was able to create ombré trees. These are set into vintage candle holders filled with hot glue and finished with glitter. Here is a tree that has not been colored, tucked into an antique record cylinder used as an artist trading card display. 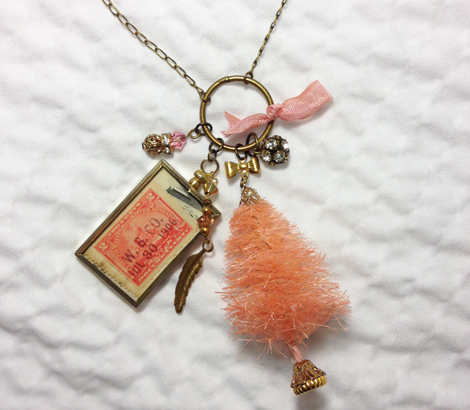 You can even make jewelry charms with these little trees! 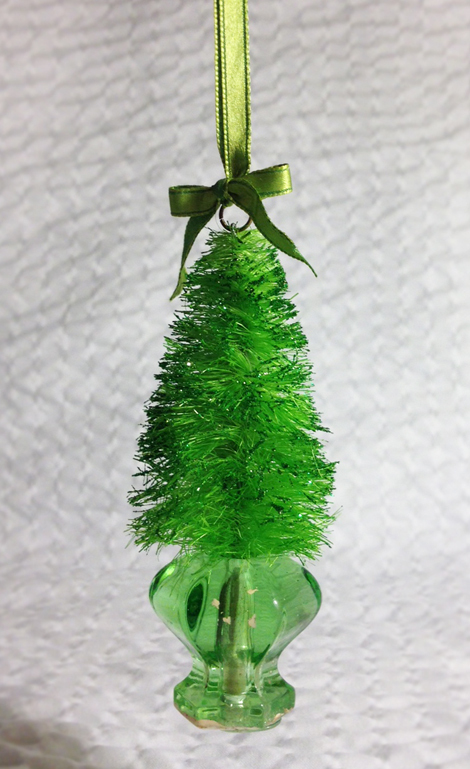 Sisal bottle brush trees can be used throughout the year for occasions other than Christmas. They make adorable Easter decor. Here’s one tucked into an egg cup. I glued this glittered tree into a vintage glass drawer knob, placed a jump ring into the bent top wire and created a holiday ornament. 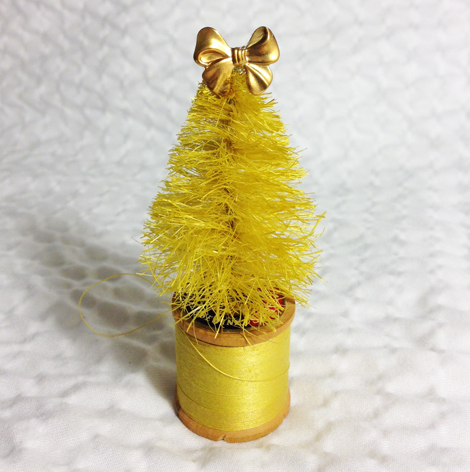 Tiny embellishments can be glued around the tree like ornaments. Here I used tiny jingle bells, and glittered scrapbook supply stars glued back-to-back as the tree topper. I found the tree base as-is at an antique shop- score! So many cute little containers make good pots for planting these trees. 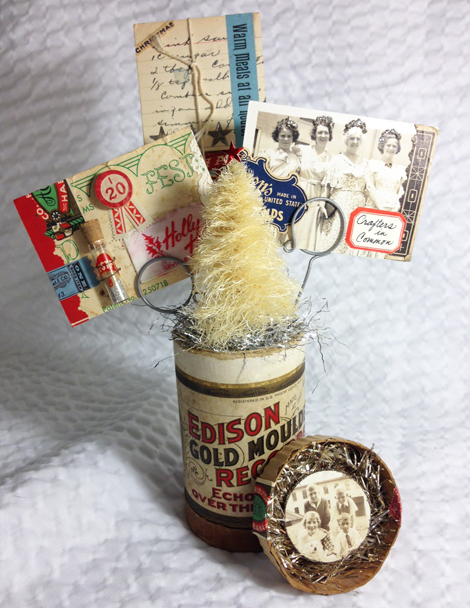 Here’s a vintage and decorated toothpick package stuffed with floral foam and Spanish moss. 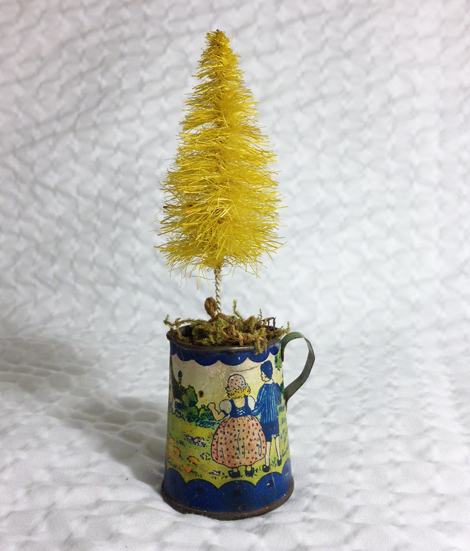 Even this tiny tin toy pitcher makes a sweet tree pot. Of course there’s the ol’ stand-by apothecary bottle filled with glitter. I drilled a tiny hole into the cork before poking the twisted wire into it to keep the cork from breaking. 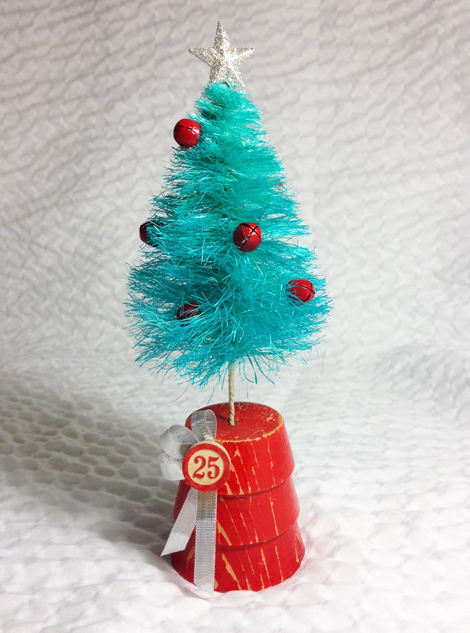 And, lastly, here is my tiniest tree that is just under two inches tall. These trees are just so much fun to make. I make them assembly-line-style over many days. One evening I will cut and unravel rope on the coffee table while watching a movie. Another day I will wire and spin and trim. Another time I will dye and dry them. The final trees are great to keep on hand for future craft displays or to use as favors, ornaments, place settings or a few dozen other uses. Have fun! 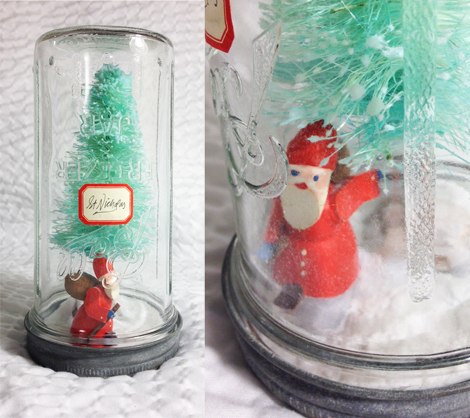 This entry was posted in Christmas, Decorating, Easter, Holiday Crafts, Uncategorized. Bookmark the permalink. These are AMAZING! I hope I can try to do these some day!!! TFS! Once again Cathe does it! So cute, and I’ll bet they are so much fun to make. Thanks! I really want to try this! Thank you for posting this tutorial. Your ideas are so inspirational! These are just gorgeous Cathe! Thanks for sharing. This is such a wonderful tutorial – thank you so much for sharing. I will be making these to use in a winter wonderland display for my entry table. this is genius! love all the colors! This is just the best tutorial I have ever seen. Thank you SO much for sharing! Your little trees are magical! Your trees are so heart warming. Each with their own personality. Beautiful! Those little trees are amazing, and you are a genius! Loved your tutorial, and all of your creative examples using them. Thank you! So cute!! I will try this for sure! Thank you! Cathe, Thank you so much for sharing your method of making these amazing trees. I need some teeny tiny ones for little putz houses, and these will be perfect, as well as making some to use in model train displays. You are so kind to share your knowledge and your wonderful skills. Love, love, LOVE these!! Can’t wait to try some myself. Thanks so much for the how-to. Wow! I love these! What an amazing tutorial! Will be running out to get supplies today- can’t wait to try this! Thank you! This is fantastic. I saw a color-your-own tree demo online last year but love this one even more. The examples you made are exquisite. Thank you for sharing and I’m posting a link on my blog about your article. Thank you SO MUCH for this tutorial! I’ve always loved bottle brush trees, but can’t seem to justify spending the money on them, because I just KNEW there had to be a way to DIY them. What is the largest tree you’ve made? I want to do some 6″ or 10″ tall ones, and am worried about stability? I guess I can try and find out! I think it can be done, though I haven’t done one quite 10″. I suggest a slightly heavier gauge wire and lots more rope fibers. Let me know how it goes! I didn’t have a problem with the taller trees. I found that its basically impossible to use too many fibers. If I’m not sure if its think enough, I pile more on before twisting. Thanks again! Thank you! I always wondered if a person could make these. Will definitely try this. Love every one of these! Thanks for the tutorial and all the amazing, unique ideas for embellishments and display. Thank you so much for sharing. These are adorable and you have so many clever, sweet ideas for use! This is one of my favorite blog posts EVER!!! Love all these tree ideas….thanks so much for sharing them! aw lovely – what a great idea and what a lot of ideas for us to try! These are just adorable and lovely. Thank you…think I might have to give tis a try! LOVE!! Just gorgeous! These put a smile on my face. Thank you for sharing your wonderful talent. you win my favorite-person-of-the-week award, hands down. I love these trees so much and have never considered making them. Life changed. This is GREAT! I LOVE bottle brush trees! Pinning! What a wonderful tutorial! You are so generous to show us all how to make these. Everyone who reads this is going to want to make them. What I love most is your incredible creativity, as shown by the many ways you choose to individualize your trees. Thank you! When the wire is bent in two it holds the fibers in place. Then when the wire is twisted using a power drill and vice, it crimps the fibers permanently into the spiral of the wire. No need for any adhesives. this is FANTASTIC… when I was a child my mom had a WONDERFUL Christmas village with all kinds of little trees,, I have been wanting to make my own little village but could never find the trees or other little decorations… NOW ,, thanks to you I can make a BUNCH of trees and let my friend know so they can also. Just a follow-up to my previous comment- I tried this today and they turned out great!!!! Still some trial and error getting the amount of fiber for each tree just right, but I am thrilled with the results! I’m using a Wooster’s paintbrush cleaning comb (the side with the “nails”) to fluff out the fibers- works great! Thank you again for a great tutorial! I absolutely adore these, and had no idea at all how they were made. I’m so tickled to now know, and I can’t wait to give them a try. Really love all your fun ideas. Thanks so much for sharing! Amazing. I have all the supplies and am ready to go. Thanks for sharing your technique. I adore these! I’m in Petaluma too but can only find natural tan colored sisal. Where did you find the bleached cream color? I’m wondering if I can dye the tan stuff?! Love, love, love these! Try Orchard Supply Hardware, in the far back right corner. There’s plenty of it! I think I found some at Maselli’s on Petaluma Blvd. as well. Thanks Cathe! I’ll try Maselli’s OSH only had the natural tan. Did I mention I LOVE these? Thanks for posting the tutorial. I did use the natural color. It may appear more white in the photos but it’s a bit straw/light blonde colored. Your creativity leaves me speechless. Those trees are amazing, thanks for sharing the how to’ s. I hope Friedman’s has some sisal rope. They are having a sale this weekend! Great job! I like your idea of making your own drill bit to turn the wire. Thanks for sharing! You have L.I.T.E.R.A.L.L.Y. Changed my life A.G.A.I.N.!!! I have always wanted to try this and now you’ve given me everything I need! Or so I thought. I’m 2 for 2 on breaking them off. Not quite sure what I’m doing wrong. Maybe my vice grip isn’t tight enough…or maybe my drill is spinning too slow or too fast? Any guesses? This is the best tutorial on bottle brush trees that I have found! Thank you for posting!! What an amazing idea and amazing job you did making those! Thanks for posting this, I have been looking for ideas on how to make tiny trees for a while! j’aime beaucoup c’est très joli. These are incredible! My husband may think I’m crazy trying to make these, but nevertheless, I will! These are wonderful! I have seen other tutorials like this one, but yours makes it look so simple that I just might have to try it! And all your inspiration photos are fabulous! TFS!!! So incredibly talented…the trees are perfection! Thanks for sharing. You are so amazing. I enjoyed your sisal trees so much! Great tutorial…can’t wait to try these for next year! Best Christmas craft ever! Thanks for the tutorial , will definitely make some with my family this Christmas. Oh. My. Word! You are so stinking awesome, it’s not even funny. So awesome! Thanks for sharing! I hope to one day try them myself. 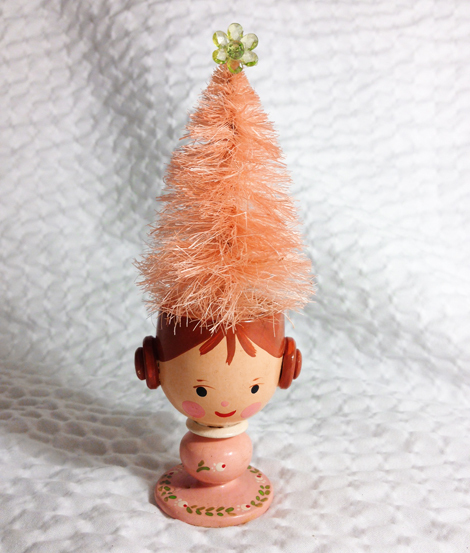 I want to make a candy corn tree. any suggestions how to keep the yellow clean while dying the orange? I am in complete and utter awe of your creative know-how!! I love these trees and never thought they could be made, I bought green ones and had to bleach them, I saved three, the other ones were ruined but your idea is the best and easier. Thank you so much for your God given talent, and sharing with us. I have never seen such a cute tree. I also want to make, but the type of paint and how to paint the color do not know. Would you please tell me if you feel up to it? found something my dh would do for me. He’s retired and likes to work with is hands. I paint…….sounds like a good combination!! Right now I’m going to look at the rest of your offerings. Thanks again. Muchas gracias por compartir este tutorial, me encanto. Muchas gracias por compartir este tutorial . Me encanto. I search pintrest all the time to find cute ideas. This is the best one ever. 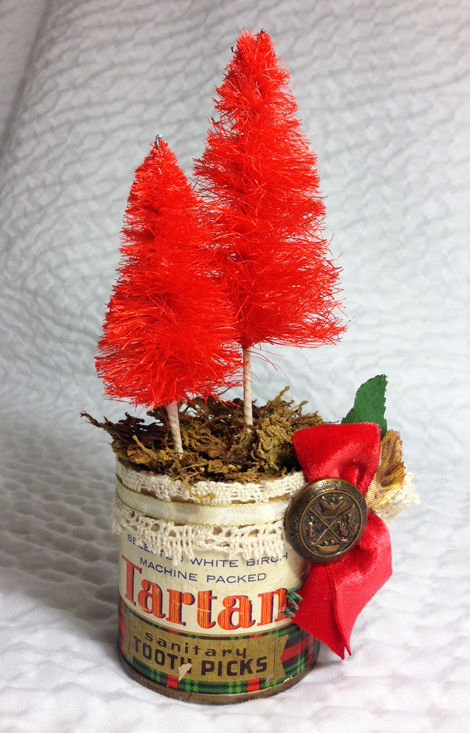 I cannot wait to make my little trees for an altoid box. Thank goodness I found your page! I’ve been looking for a tutorial on how to do this that was a bit more in depth. I’m so looking forward to making these. Thanks for sharing your step by step process! Thank you so much for sharing your tutorial!!!! I have seen a few others, but yours look much easier and yes, cuter, than the others I have seeen. Now I just have to find my sissal rope and get to creating! I alreadyy know they will be quite addictive and I’m looking forward to all the glitter mess and finding the perfect ornaments to tuck between the branches. Thanks for the wonderful tutorial! I have the rope & a husband with a drill – gonna give it a try! read through tutorial with my husband who has a drill and a miniature train layout and I think he’s more excited to make these than me!! Wow !! What a great project ! These are Wonderful!! I have a Dept. 56 Dicken’s village and my daughter has Christmas in the City. These will be a wonderful addition! The ones I have now are not the right color and I will have so much more control on the size and color! Thank you so much! Can you tell me more about the colors. Are you mixing colors of dye to get some of them? I’m having a hard time finding very many bright colors in the liquid dye. Can I use powder dye and dilute it less that the directions say? Love the bright one and the varity of colors. Absolutely adorable! Thanks so much for sharing all the details to make them, and how you use them. Very very inspiring. What sweet little trees! Thankyou for sharing your tutorial. Thanks for the generously shared tutorial. The trees are incredibly cute. Now I have to think of a Southern Hemisphere use for them 🙂 I live in Australia. I’ve always loved the idea of a white Christmas but instead, usually swelter in the heat…. Absolutely love the vintage look . I will be making these tomorrow !!! Thank You so much for sharing this. They are so pretty. You ROCK these are awesome, and I cannot wait to try this! Thank you sooo much! I love these and they are so expensive and so hard to find in the sizes I want!!! Just made one and I can see they may be addictive! You are insanely genius! Thank you so much for this. I need quite a few and, if possible, prefer to make things myself. Also, I can include my husband in this, as he loves helping me out with little projects. Again, thank you! Some of the best directions I have ever seen. Your ideas are wonderful, TY for posting. Love the fact that they can be made in any color. Did you go to Goat Hill again this year? It was gorgeous and so much fun! Two Buildings this year! Fabulous I have been searching for how to do this for years…so much time to make up for! Thanks so much for the tutorial and great ideas! At last I can make a sisal tree the size I want and on the cheap too! 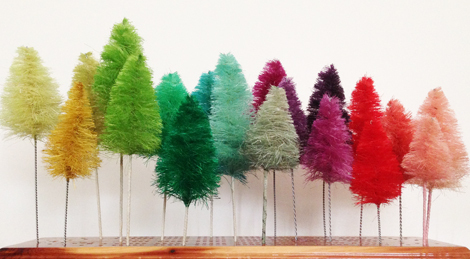 Thank you for your tutorial on making DIY bottle brush trees. I have been looking for something like this for a little while and finally, I found YOU! Thank you for such a detailed and easy to understand guide. I will be making quite a few of these. Love! Just made a few…they don’t look as perfect by yours by a long shot, but that’s ok… wondering if you have a good way of separating the sisal…mine is very rough and difficult to handle after a few trees..? I’m a little confused by the drill part? Is the drill used to make the trees fluffy, as well as making the wire twisted at the bottom? These bottle brush trees are wonderful! I love that Mr. Finch mentioned your blogg and bottle brush trees on his Facebook post today! These are beautiful. It brings back childhood memories of playing with bottle brush trees and other miniature treasures under the Christmas tree at my Grandma’s house when I was little. I may just have to give this a go. Your site is very lovely and the tutorial very descriptive. Thank you for sharing your lovely art. Thank you -thankyou-thankyou for sharing, I can’t wait to have some fun! Não tenho como prendê-la para fazer, mas acho que com um processo manual, conseguirei. I have never seen any thing like the this to make.. I think my grandboys boys are going to like making them.. Yes boys no girls yet LOL.. But the boys like to do crafts with me.. They are all so pretty! I love the colors you chose. Love it!! Thank you! Do you have any resource for the tiny reindeers? Show a woman one of these, she will always ask you for one, But show her how to make one, and she can always make her own. Then you can get on with what you intended! LOL! Thanks soooo much! Unlike the others, Im doin it!!!! 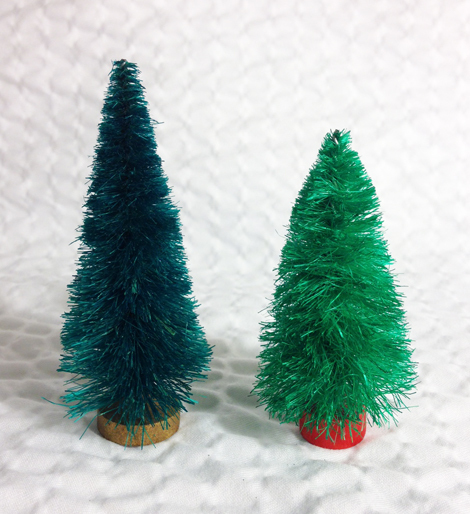 Your bottle brush trees are so cute! I like the soft vintage vibe of them! Good work and nice examples how to use them! I tried this out & they are just too cute. I used the left over ornament hooks I had (since they only seem to come in packs of 100) to make little ones and used them on my gifts with along side the name tags, and thanks to my fiancé being an electrician I have an endless supply of wire scraps in all shapes and sizes. I am very excited to see what else I can create useing this techniques I couldn’t imagine how you came up with this but it is so adorable and I thank you for sharing! I love all of the stuff I accidentally end up creating it is always seems to end up better then what you set out to do! Absolutely fabulous! Thank you so much for de-mystifying the process so clearly & colorfully. I priced the (Chinese) imports this season & was not happy with price or quality. Also have a few “ancient” ones from my childhood Christmas doo-dads, but they are heavily encrusted with fake snow globs, which aren’t typical for our southern holidays. Love your tips on coloration & suggested bases. You are a crafty co-hort after my own heart! Спасибо большое! красиво и оригинально! Can I make these 14″ tall? Such a delight. Thank you. Thanks so much for sharring this thecnichs, i love it! Amazing. REally, these are amazing. Thanks so much for sharing. Amazing! Who would have thought it would be so simple! These are absolutely stunning! I’m definitely going to refer back to these during the holiday season. I LOVE THESE AND WOULD LOVE TO TRY MAKING THEM. WHAT SIZE sisal rope? 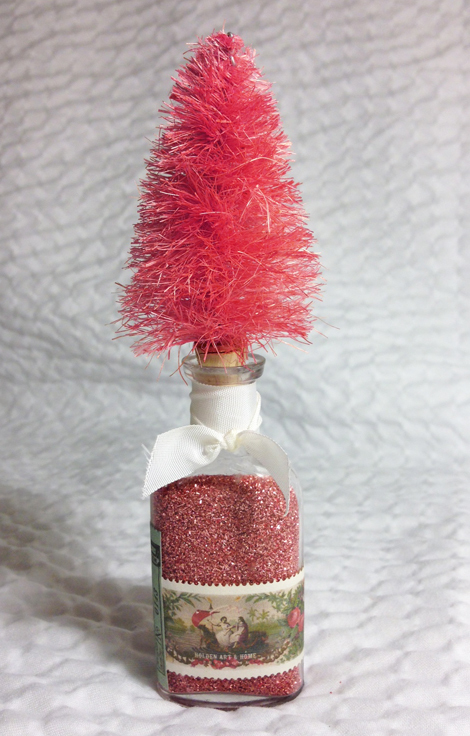 love your bottle brush handmade trees..adorable. Going to go back through and see if there is instruction somewhere. Your Christmas Tree board is adorable. Your creations are inspiring. I live in the Bay Area also.so hello from down at the.bay. I really am very creative but, a few years ago I had a major stroke. I am fine now but have a little trouble thinking things throughout am so happy to find these directions. Thank you so much. I have been busy buying vintage Putz houses. I have quite a nice collection. Have a Merry Christmas and the happiest of New Years! I had saved this on Pinterest a while back …and looking at your website now was so much FUN ….i totally want to make tons and tons of these trees now.!! thanks for sharing your talent and craft …i really enjoy each one and am inspired to make my own! !